Windows 10 has brought lots of updates to a computer system, and most of them have rendered to be highly useful to all sorts of users. One of the problems is the iPhone not detected or recognized on Windows 10. While this is true, there’s also some software glitches that Microsoft yet couldn’t quite overcome. Not all problems are caused by the Microsoft optimizations though, for example this iTunes issue we have addressed could have been caused by an improper update to iTunes as well. Whatever may the reason be, the symptom turns out to be that no iOS device seems to get noticed by iTunes that’s installed on a Windows 10 based computer. UnlockBoot team is here to help you to fix the iTunes on Windows 10 not recognizing or detecting iPhone. Read on for more details. Unfortunately, the iTunes not detect iPhone or iPad on Windows 10 problem hasn’t been properly addressed yet with a proper fix. Instead, the user has to run multiple checks manually and try to pin point the problem. It’s a longer workaround indeed but there’s no easy fix at this moment either. First stop should be the old school rebooting technique. If the computer has been updated to Windows 10 from a previous version of Windows, many files may not have settled down yet. There could be registration issues, driver issues or just some simple file segment issues. Restarting both the iOS device and computer could solve the glitch and make the procedure proceed in its normal pace. In many cases, this silly step fixes the iTunes not recognize iPhone or iPad on Windows 10 problem. Very often, USB ports on a computer don’t seem to work without portable device connection especially on laptops and front ports on desktop computers. There are voltage issues; and lower speed ports might cause issue while connecting to iTunes. Hence, connecting to an alternate USB port to check whether the device gets detected in iTunes could be an efficient workaround. In case something’s truly wrong with Windows about this iTunes not being able to detect iOS devices issue, Microsoft could have released software fixes to patch the iTunes not detect iPhone error. The patch should be delivered through a Windows Update; it’s important to have Windows Update turned on in a computer. In case that’s not possible, important updates should be downloaded and installed from the MS website once in a few days, at least. When the Windows gets updated, iOS device may not simply recognize the computer as a trusted computer anymore and as a result, the iPhone/iPad or iPod Touch might not show up on the iTunes interface. 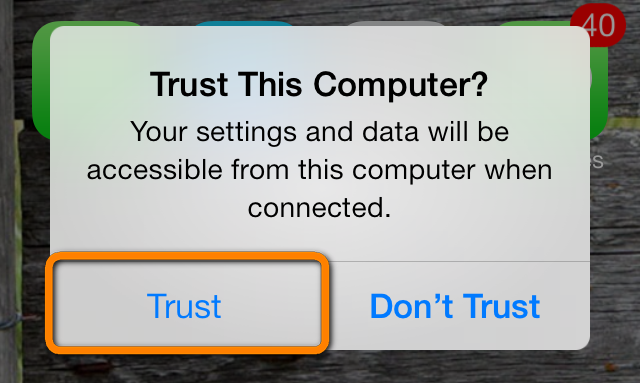 To avoid such issues, mark your computer as trusted when you connect an iOS running device to it. On a computer that runs Windows 10, the iTunes on that computer should be updated to the latest version as well. The latest version of iTunes should contain optimization for Windows 10 file system, directories and registry updates hence it’s important to have everything updates on a computer. Conclusion: These are the basic workarounds to get a way to make iTunes detect and recognize your iOS device. We recommend you to reinstall the usb drivers or try if your device works fine on another computer. In case none of these work, there might be a conflict issue with some other program installed on your computer or a hardware issue with the iOS device itself.